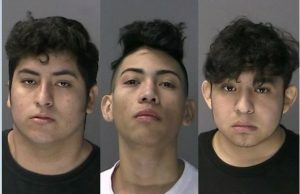 Ramon Arevalo Lopez, 19, of Huntington Station; Nobeli Montes Zuniga, 20, of Huntington Station; and Oscar Canales Molina, 17, of Huntington Station, were each charged with Assault in the Second Degree, a class D violent felony. At approximately 2:30 p.m. on Jan. 9, a group of teenagers were in the Burger King located at 837 New York Ave. in Huntington Station. In the rear parking lot of the Burger King, the defendants allegedly attacked the group of teenagers while armed with baseball bats and a knife. “While it’s not clear what the groups were fighting about, one thing is clear: everyone arrested is a confirmed member of MS-13,” said Commissioner Hart. During the altercation, Arevalo Lopez allegedly stabbed a 16-year-old male in his back with a knife. The victim was transported to Good Samaritan Hospital Medical Center in West Islip and was treated for non-life-threatening injuries. Witnesses saw the three defendants flee the scene in a black 2007 Toyota Scion with a large spoiler on the rear of the vehicle. Suffolk County Police officers located the vehicle at approximately 3:30 p.m. The defendants were found with blood on their clothing and hands as well as on the vehicle. Two knives were recovered on Canales Molina, including a small knife, which appeared to be covered in blood, which was found in his shoe. The defendants were arraigned today by Suffolk County District Court Judge Gaetan B. Lozito. Bail was set for each defendant at $35,000 cash or $75,000 bond. They are due back in court on Jan. 15. If convicted, each defendant faces a maximum sentence of seven years in prison. All three defendants were previously confirmed as MS-13 gang members by the Suffolk County Police Department. Thereafter, Arevalo Lopez was detained by the U.S. Department of Homeland Security’s Immigration and Customs Enforcement (“ICE”) on Oct. 24, 2017, and was ordered released from custody by a federal District Court judge on June 12, 2018. Canales Molina was detained by ICE on July 24, 2017, and was released from custody by a federal judge on Nov. 28, 2017. This case is being prosecuted by the Enhanced Prosecution Bureau’s Gang Unit.